Pakistan’s response to an Indian drug bust highlights the weak foundations of bilateral trade talks. Tensions rose between India and Pakistan less than a week after the two South Asian neighbors agreed to reduce barriers to cross-border trade. Reuters reports that Indian police “seized more than 100 kg (220 lb) of heroin concealed in a truck full of nuts coming from the Pakistan side.” In response to the seizure, Pakistan stopped all cross-border trade and bus travel across the Kashmir border and New Delhi summoned Pakistan’s acting envoy to lodge a formal protest. The row over the drug bust highlights the fragility of India-Pakistan negotiations. While the overall situation appeared to be improving after the Director Generals of Military Operations (DGMOs) of both countries met in late December and the trade ministers agreed to liberalize trade last week, bilateral ties remain subject to acute flare-ups. In 2013, a series of border skirmishes undermined diplomacy and resulted in a stagnant state of affairs in the broader India-Pakistan peace process. According to Reuters, the drug bust took place on Friday – one day before the trade ministers agreed to expand cross-border trade. Indian police impounded a truck that was India-bound from Chakoti on the Pakistani side and discovered 114 packets of heroin totaling 100 kg in among a cargo of almonds. Indian Deputy Police Inspector General J. P. Singh places the bust as the largest contraband seizure since cross-border trade started taking place across the militarized Line of Control in 2008. “We have followed the procedures. We have seized contraband, we have registered a case and when you register a case you have to arrest the driver who was carrying it, according to our laws,” Singh said. He added that it was wrong of Pakistan to cease all movement across the Kashmir border. Combating cross-border drug trade should present an opening for cooperation between India and Pakistan instead of an obstacle to closer trade ties. Pakistan has argued that the Indian allegations are “unsubstantiated.” Brigadier Muhammad Ismail, head of the Azad Kashmir Travel and Trade Authority, said that “It’s not for the first time [India has] resorted to such a practice,” revealing a continued trust deficit between India and Pakistan. The drug bust highlights the disappointing foundations on which India and Pakistan continue to negotiate high-level matters on trade. On Thursday, Indian Foreign Secretary Sujata Singh addressed an economic think-tank in India where she described the problems underlying closer trade ties between India and Pakistan. 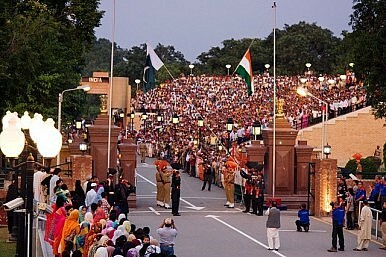 “Unfortunately, we seem to have some way to go before getting to the point of the one or of the other, or to the point where we can actually have a situation on the ground of normalized trade relations between Pakistan and India … The exception, unfortunately, has been Pakistan, for a variety of reasons, much of it hostage to political issues between our two countries which are a legacy of our history and the tragic events surrounding partition,” Singh said. Preliminary talks between India and Pakistan on trade have produced promising results. Why the Pakistani Establishment Is Rooting for the BJPWhat Does India’s Strategic Community Perceive As the Country’s Largest Challenge?Indian Foreign Policy After the Elections: All Eyes on ChinaIndia-Pakistan Tensions Test the Shanghai Cooperation Organization's MettleWhat Message Does the Latest India-Pakistan Crisis Send to Militants in Kashmir?